Please click the button at right if you live in Ventura County. Ventura County has a different ballot layout and has different instructions. Please use the following two diagrams when voting at the polls. DO NOT mark the ballot for Member, State Board of Equalization 3rd District. Notice that my name is not there. If you mark Jerome Horton and write-in G. Rick Marshall, you ballot in that office will not be counted. Only vote for me by writing the office, Member, Board of Equalization, 3rd District in the Office box and my name G. Rick Marshall in the Name box. If you forget my name, you can ask for the official list of write-in candidates and they will show it to you at the polls. 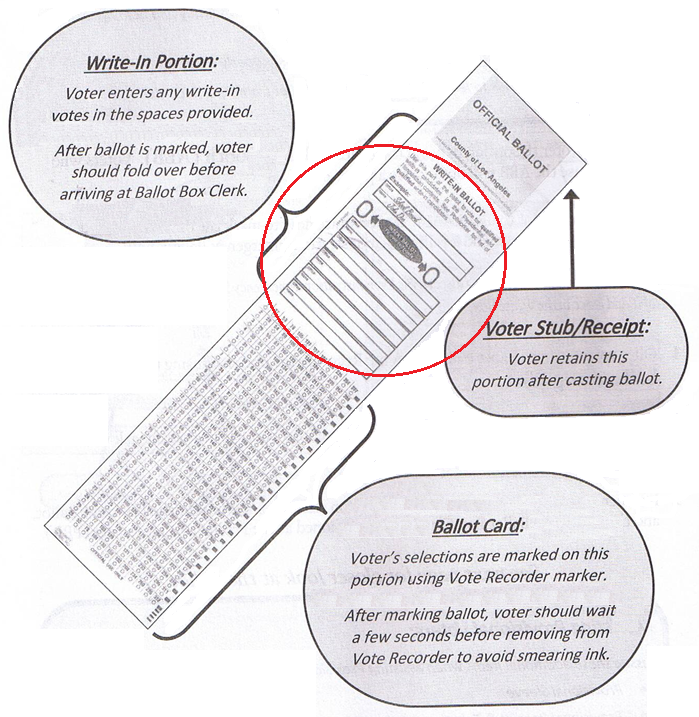 The diagram circled in red demonstrates the portion of your poll ballot where write-in voting is legal. Please refer to the diagram that is circled in red. 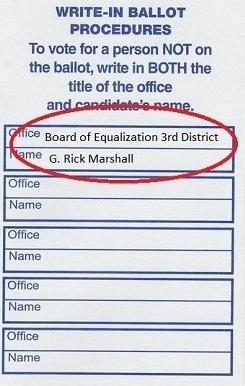 With reference to the diagram at left, please write "State Board of Equalization, 3rd District" (be careful to print and write small as there is not a lot of room) in the office box and "G. Rick Marshall" in the Name box. Make sure both are legible. You may need to remove the ballot from the inka-vote machine or you can vote for me before placing the ballot in the machine. 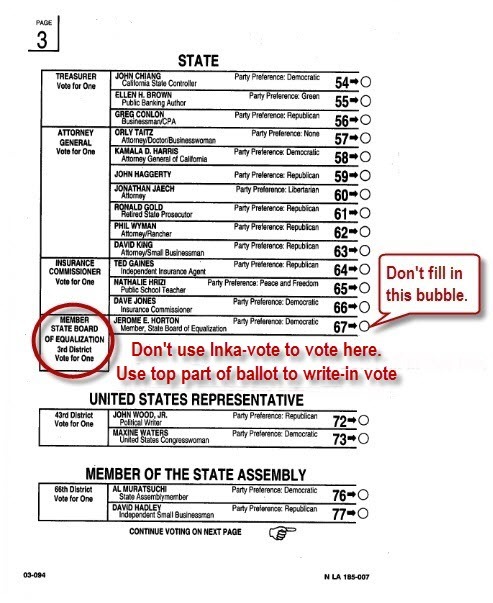 Don't fill in the bubble on the ballot for Member, State Board of Equalization, 3rd District as shown above. Write the office name in the Name box, "State Board of Equalization, 3rd District". This is the official name and is required. Write the candidate name in the name box. Please write "G. Rick Marshall"
When you are finished voting, remove the ballot and fold it at the perforation so the poll worker cannot see the write-in vote as they place it in the verification machine.